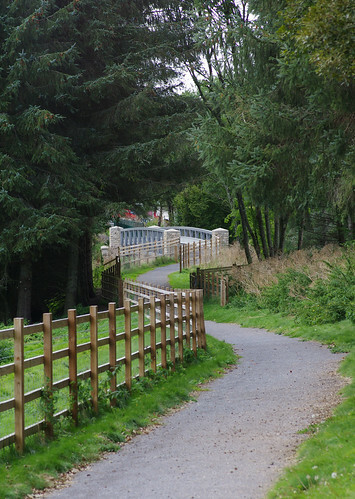 Across the country, disused railway lines have been given a new lease of life. But in many cases there is not the faintest sight of steam and the accompanying whistle or the rattle of following carriages. In place of locomotives, you will see and hear cyclists wheeling past or the firm scrunch of walking boots on compacted gravel. These routes are intended to provide a safe alternative to using main roads that can be busy, narrow and partly unpaved. 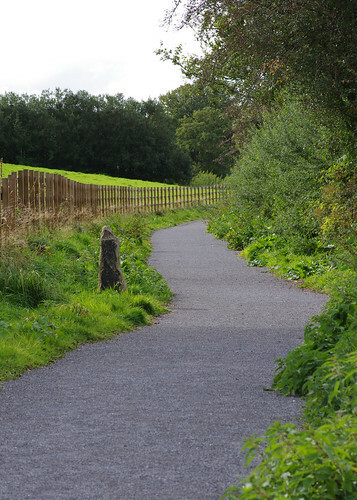 We walked the traffic-free section between Budleigh Farm and Moretonhampstead in 2011, not long after it had been opened. Then everything was fresh and new. At the path borders it felt distinctly like nature had not yet moved in. We were both keen to return and see for our ourselves if there had been a natural progression during the intervening year. The path near Budleigh Farm. The main road lies under the bridge in the distance. As we predicted, things had grown. There were a greater variety of flowers to ponder than previously. These flowers are found on a local basis in parts of Devon and Cornwall. 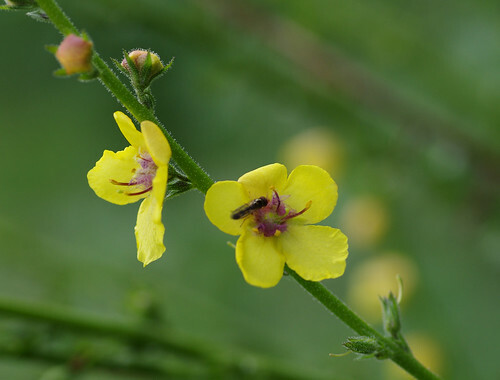 As usual, I procrastinated over which species it could be, embracing the 'dark' and 'moth' varieties before arriving at 'Twiggy Mullein'. Please note that the latter two share similar characteristics. 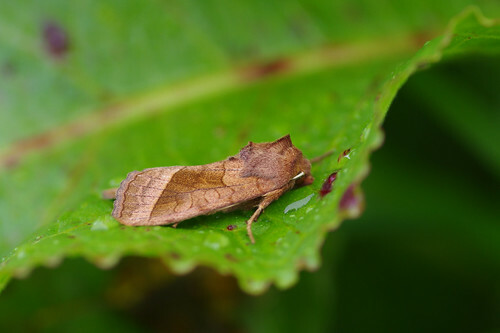 Although Moth mulleins preodminantly possess white flowers there is also a yellow variation. 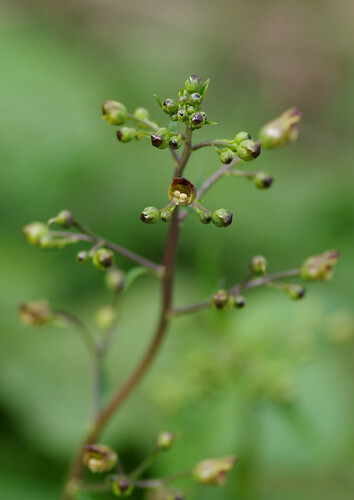 They also share sticky glands along the stem. If I had a guide with me I would have read the entries and could have examined the whole plant for sticky glands. How should we define a 'wild' flower? I have seen internet forums where species that have been here for centuries are discounted - on the basis that they are not indigenous i.e were here long before the Romans invaded. The sheer diversity of our flora is largely accountable to a high proportion of those flowers being imported. Similarly, I could not be sure whether these flowers had been planted to complement the reopening of this section of the old railway line or if they appeared as a result of the reconstruction work. 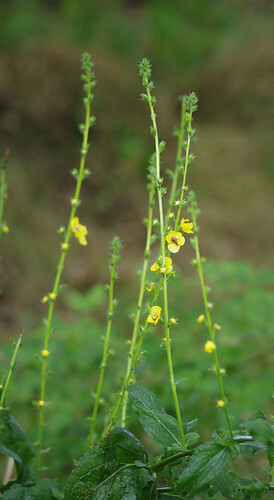 Some seeds can be buried for many years before finding their way to the surface and flowering. It would be gratifying to know how these mulleins happened to be here but either way they are still wild in my book. Photographing different angles of familiar flowers can sometimes render them in a more exotic light. 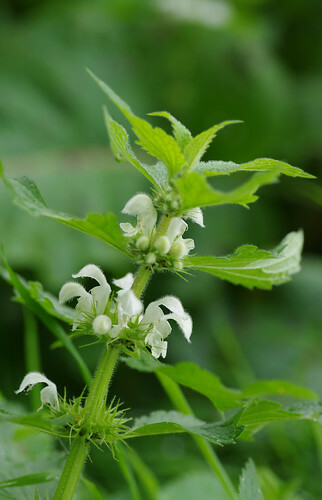 These nettles do not sting. But that does not prevent me from occasionally putting my hand on a leaf - almost in the earnest hope that conventional wisdom be momentarily turned on its head. 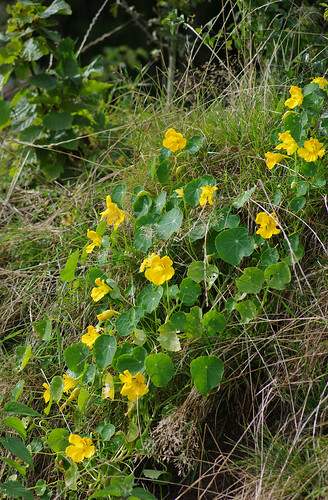 Nasturtiums are a common sight on many garden allotments. They are also occasionally found elsewhere. Another species to add to our list! 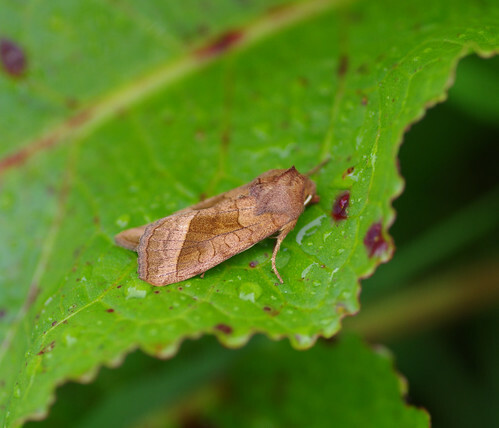 At first we were concerned for this moth's welfare. Raindrops pelted its body and it showed no signs of movement. I suppose a raindrop hitting a moth could be comparable to humans being struck by medicine balls from the skies above. Thankfully the moth was alive and we left it to its own devices after appreciating the textured patterns on the forewing and noting that, close-up, the creature had a face remarkably like a Hereford bull. Sherry tried a number of times but was unable to get this grass without the wire of a fence in the background. We have since bought a groundsheet - another 'little something' for me to carry. At this rate I will look like a bodybuilder without ever having set foot in a gym. The grass was past its flowering best but that was only to be expected for the time of year. Another shot showing just how much things have moved on since last year. The path and its borders now happily coexist. 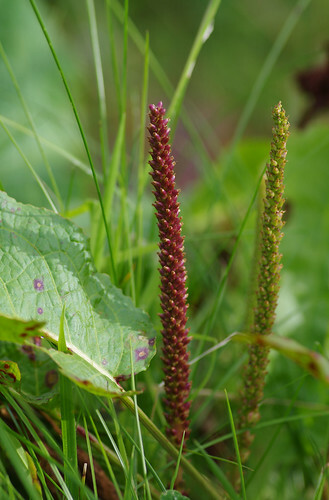 Sometimes plantain flowers redden. In normal colour the one on the right has been eclipsed. 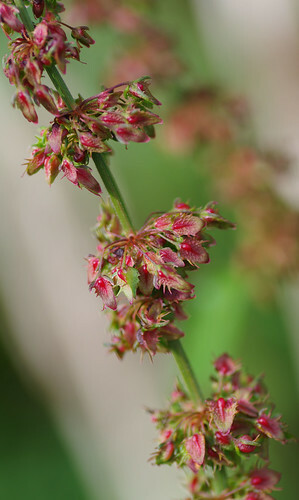 These delicate seeds are the plant's fruits. Sometimes the background of a photo can almost ruin a sharp foreground. Here it complements the red seeds and helps produce a better composition. Another common flower in this habitat. 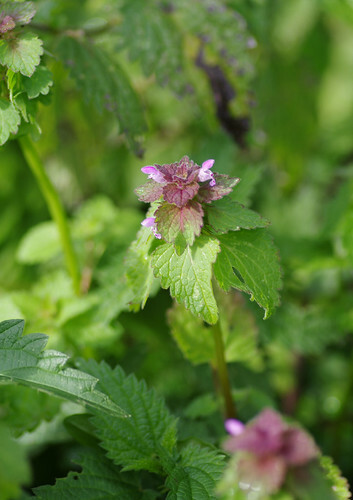 There are several similar-looking nettles but the darker leaves at the top unquestionably identifies this species from its relatives. Not long after encountering these medusa-like plants by a damp margin, we came to the end of the railway section and turned right along a country lane leading directly into Moretonhampstead. At first I thought these could have been French Crane's-bills. But the flower above is markedly a darker pink. 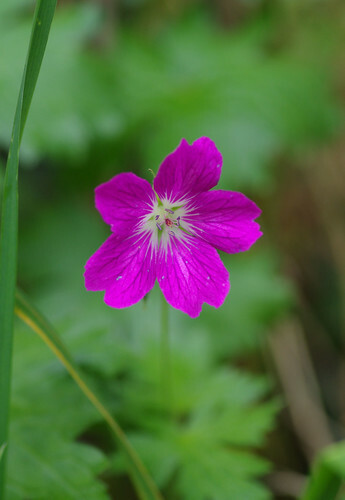 Could this be a cultivated type of geranium that has been planted in the hedgerow? 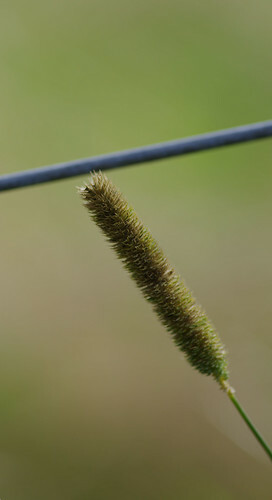 I also wonder if the nutrients in the underlying soil can sometimes play a part in determining the colour of a flower. Grazing in the foreground is poorer than the hills behind. 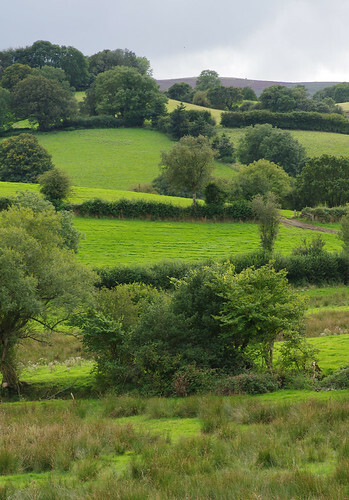 The open moor can be seen above in the background. Seeing a view like this always inspires me to move through the landscape, and by doing so, temporarily play a part in the picture. But it is impossible to be everywhere and see everything at once. There is joy in knowing when to move and when to pause and admire the scenes that unfold before your eyes. Getting the balance right can be tricky at times. Out of frame we saw a buzzard sitting on a fence post, waiting for its next meal. As we walked back, we began to anticipate our next meal, as well. It's quite possible that as we sat down to dine that buzzard was still there on its post, exercising patience and determination; waiting for the slightest rustle in the reeds. It's easy to take our many privileges and freedoms for granted; to forget just how lucky we are.